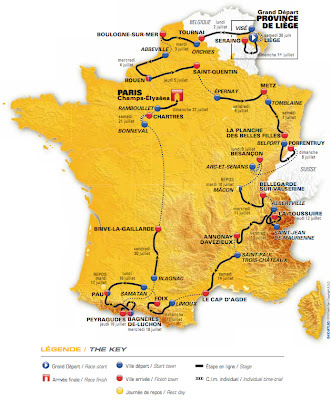 Finally we know the route of the stages of the 2012 Tour de France. 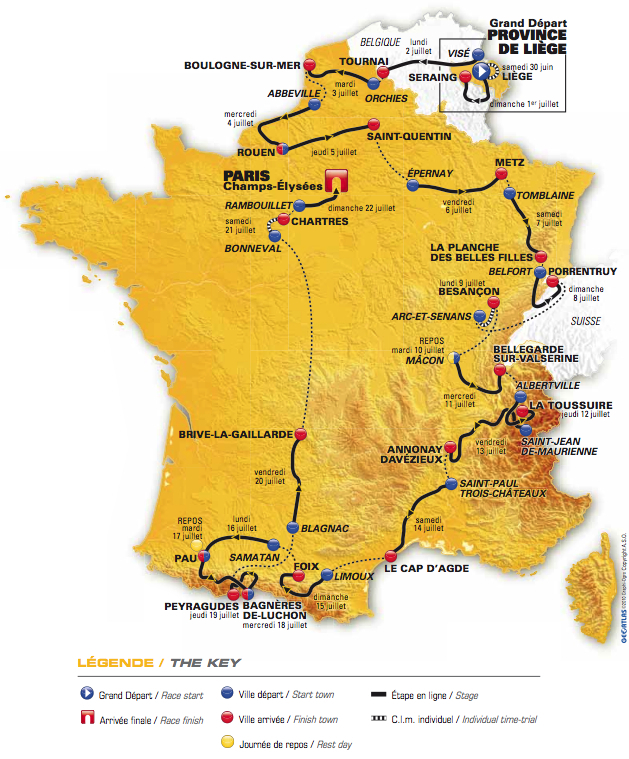 Sure we knew that information last week, and yes, I already know what stages I hope to see in 2012, but what we learned today were the climbs to be included in each stage of the Tour. What amounts to the exciting reading of been there done that, or the determination of I want to be there! We also learned that Cadel Evans, Alberto Contador, and Andy Schleck are again pitted in battle for the overall win, not so surprising. Neither was the fact that Contador happily pointed to Evans as the possible winner, which translates precisely to, please inundate him with pre-race interviews. I predict we might see a different winner in 2012. Tour director Christian Prudhomme believes this as well in saying, "more favorites can potentially be in the mix." The big surprise of the day was Philippe Gilbert's choice of a cummerbund, which more than made up for any other lack of surprises. When they reveal the new 2012 Radioshack Nissan Trek (x-Leopard) team, I call for a cummerbund scarf combination! Also it appears Alberto Contador and Cadel Evans called each other ahead of time, deciding to go for the Men in Black look, but no photographer seemed to capture this fashion faux pas. It was also no surprise that Mark Cavendish intends to go for the green jersey in 2012, it is a wonder how he plans to turn a Pinarello into a mad racing machine. This morning in Paris, marked the annual I will dominate smack talk expected to fill cycling journal headlines for the next 8 months. I have learned to ignore much of it. I keep myself busy trying to recall how to spell maillot jaune and brushing up on my Mark Cavendish accent translation skills by exchanging every th with an f. No one understands me here in Colorado, but I will be ready come July. I also study up on the numbers, which change every year. It never fails I meet someone who asks me these same simple questions: How many stages? How many riders? How many teams? How far? And who is winning? For 2012 it will be 20 +1 (prologue), 8 or 9 riders per team (there might be changes in number of riders this year), 18-20 teams, riding 3,479 kilometres, and "I haven't a clue who is winning, I just spent 9 hours on some mountain pass". What is nice and easy for 2012, is that Stage 1 is on July 1, Stage 2 on July 2, and so it proceeds nicely until the riders need a rest day after Stage 9. I say why rest, when it just messes up the calendar. Today sealed the deal on my plans to go back to France in 2012. I admit it had far less to do with this route, than the availability of British Airways flight miles to get me there, and back (back was the tricky part due to the Olympics in London). Plus I have a friend nutty enough to travel along with me, and she can ride a bike - a rare combination! I also seem to not only long for, but enjoy, the challenge of traveling single-handedly with an enormous bike case across the Atlantic through airports and customs, turnstiles, and rental car pick-up locations. All for the joy of riding a bicycle in France. I joked with a friend last week who commented, has anyone ever asked you, "that is the biggest suitcase I have ever seen, what is in there?" I recommended he reply to that question with, "I like shoes." So me and my big suitcase of shoes are landing in Lyon, France, in July 2012. Time to once again explore France and report from the Tour de France. Bon Voyage. This is what I really wanted to know. I have yet to climb the Col de la Madelaine or Port de Bales. Or the Grand Cucheron, which is one of those climbs they claim averages 6.9%, but instead has lots of 10+%!